The winner is JUVIA'S PLACE NUBIAN 2 palette. Slowly and lately JUVIA'S PLACE started winning of heart many. This is one brand that I felt actually thought to work over on shades that will suit dark complexion. 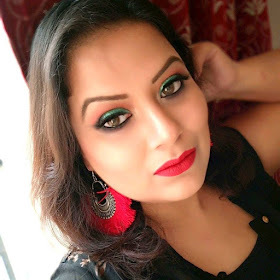 Being a yellow strong undertone holder, I mostly crave for shades that are exotic and my perfect exotic shades search ends on JUVIA'S PLACE NUBIAN 2 palette. Availability: - JUVIA'S PLACE don't ship directly to India so one had to use SOFU service (I have given a detailed information about it here ) or you can buy from Instagram sellers who are selling it in Rs.2500/-- Rs.3000/- range. The palettes come in a beautiful yellow hard cardboard packaging with magnetic closure. The palette consists of 12 beautiful shades. Among these 12 shades, 4 shades are matte while rest 8 shades are metallic colors. The palette is inspired by NEFERTITI, a beauty icon who is known for her beauty, strength, spirituality. All the shades of this palette are perfect to create some classic or exotic looks. The palette is paraben -free product. It is a cruelty-free product too so a big thumbs up on that. JUVIA'S PLACE is my recent crush brand when it comes to collecting eyeshadow palettes. They have some super pigmented, buttery texture eyeshadows. There is hardly any fallout issues with any eyeshadows which I face till now. The shades are equally pigmented when used by a dry or wet brush. I love how sleek is the packaging it has and so it is easy to carry during traveling. The pan size of the palette is so big that it will last really long then you can imagine. The palette is beautifully color co-ordinated which is just perfect to create any classic look or any exotic look. The matte shades are perfect for the crease and outer corner of eyes while the metallic shades are perfect to create that oomph factor in your eye looks. Overall I am loving this palette a lot and definitely I will recommend it to every eyeshadow lover to try it. The shades might look dupeable but the packaging of the palette and quality of the eyeshadows actually making it different compare to other brands.